Elsouf, Newreyan:Ælsef, is the most northerly region of Midrasia, bordering both Newrey and Cuirpthe. The region itself plays host to the Elsouf river valley from which it takes its name. The region comprises 9,857.14 square kilometres (3,805.86 sq mi) and has a population of 5.7 million inhabitants making it one of the least populated regions in the country. Elsouf is also bordered by the Midrasian regions of Avadin and Padania to the east and south respectively. In terms of period of consecutive governance, Elsouf is the newest province of Midrasia, having only been created in 1791 when it was made independent of Padania. The region has been ruled by Midrasia for around 230 years, however the region had previously been a Newreyan province for nearly a millennium. Elsouf is a landlocked region with much of the province forming the basin of the River Elsouf. Within this river basin lie a number of small lakes, the most prominent of which is Lake Aubrey. The province is lined by hills and mountains at both its extreme east and west, effectively making the province a bottleneck in northern Midrasia. The southern border of the province is mostly flatland and fields, whilst the northern sections give way to a series of minor hills on the Newreyan border. The region is home to three national parks, the Trier National Park, Neuton Lakes and the Durhome Forest. Elsouf was historically a part of the Fiorentine region of Novarum along with the Newreyan regions of Cyningburgh, serving as a border province within the Empire. As Fiorentina declined however, the region was overrun by various barbarian tribes and abandoned. Within subsequent decades the region came under the control of the various Newreyan kingdoms, become an integral part of the Kingdom of Ælsef. The region continued to be a part of Newrey and the succeeding Commonwealth. Nevertheless, the region was annexed by Midrasia following the War of the Commonwealth in the 1780s during which the Newreyan-Cuirpthe Commonwealth was broken apart. It was during this time that the majority of the ethnically Newreyan population was removed, though it was allowed to return following the new constitution of 1791. In the subsequent decades, Elsouf became somewhat of a manufacturing hub, with a number of steel and textile industries developing within the region. Prior to the Great War, Elsouf was an area of considerable tension between Newrey and Midrasia as a number of Newreyan governments sought to reclaim the province. Nevertheless, the Newreyan Kingdom chose to ally with Midrasia during the Great War, seeking instead to expand its overseas empire. In the subsequent decades, the Midrasian government sought a cordial relationship with Newrey, going as far as to pay an undisclosed indemnity in 1925 for its annexation of the province. Nevertheless, a number of prominent Newreyan figures have called for the province to be reclaimed by the Kingdom, especially with the onset of the Newreyan Civil War. The region's contribution to Midrasia's gross value added was around 2.5% in 2010, whilst its share of the population was around 4%. The GDP per capita of the region in 2010 was $26,322.50 making the per capita income one of the lowest in the country, with a significant wealth gap from the more prosperous southern regions. The largest industries within the region are agricultural and service sector industries. Other large industries include textiles, food processing and furniture manufacturing. Though in recent years the region has seen an influx in manufacturing plants related to the automotive, aerospace and armament industries. The influx of these new jobs has been part of a governmental scheme introduced under the Vauban government to invest in the less prosperous regions of the country. Whilst the Elsouf region has a good network of roads, with the region connected south by both the A4 from the Cuirpthe border at Sombourg to Vabre, and the A16 which runs through Wincaestre to the Newreyan border. Nevertheless, the region is lacking in terms of other transportation options. The region is served by national rail, with trains on the Transpadanian route running through the area. Nevertheless, rail facilities in Elsouf lag behind the rest of the country. The regions rail lines are not electrified and the region has only one dedicated international airport at Wincaestre, though its service area is relatively small comparative to other international airports in the country. Emigration from Elsouf has been prominent through the past few decades as migrants from the region have moved south or to Newrey in search of better job opportunities. The last year that the region received net migration however was in 2012 as investment poured into the region. Nevertheless, on balance the trend of emigration has continued. Of the 5.7 million people in the region, the majority are of North Midrasian or Newreyan descent. The majority of these are remnants of the Newreyan community that was displaced following the regions annexation by Midrasia. Of all the regions of Midrasia, Elsouf has the lowest number of migrants from outside of Asura, with the region dubbed the "whitest in Midrasia". The region also has a significant Alydian presence comparative to other areas of the country, with around 75% of all inhabitants describing themselves as 'Orthodox Alydian'. Local cuisine in Elsouf is viewed as a mixture of North Midrasian and Newreyan cooking styles, with poultry, beef and potatoes making up a majority of regional dishes. The official regional dish of Elsouf is steak and mashed potatoes served some variance on gravy, broccoli or onions. As with the majority of Midrasian regions, the regional language of Elsouf is Midrasian, which is spoken by the majority of the population. Nevertheless Newreyan remains prevalent within the region, with around 500,000 Elsoufians speaking it as a first language. Newreyan is also heavily taught as a second language within the region. 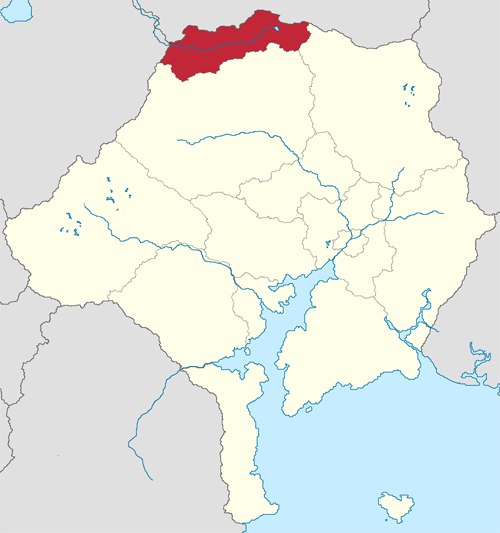 Additionally, a very small minority of people near the border at Sombourg speak Cuirpthean, though the majority of these groups come from economic migrants who travelled to the region through Midrasia's various freedom of movement agreements. This page was last modified on 15 April 2018, at 15:34.